Once established, the Exeter book trade of the seventeenth century gives an impression of being generally inward looking. The large majority of the members belonged to three artisan dynasties, all of whose members were freemen of Exeter. They can be termed the Benson, Harte and Moungwell dynasties after the names of their founders. Before Peter Benson there are scattered references to various members of the book trades in Exeter but, as previously mentioned, after he became freeman of Exeter in 1573/4 there is a continuous record of book trade activity in the city. The Benson dynasty extends through five generations until 1727 when two apprentices of George May, bookseller, became free. A total of nine persons can be assigned to this dynasty. The second dynasty is that of Michael Harte, freeman of Exeter on 31 December 1593 and followed by six generations until George Bishop became free in 1722, a total of thirteen persons. In 1635 John Moungwell became a freeman of Exeter and headed a dynasty of six generations, traceable until the 18th member Robert Fish, then a bookbinder in London, became a freeman of Exeter in 1800 (Exeter freemen, pass). Of the three founders Benson was apprenticed to Luke Harrison, citizen and stationer of London and made free of the Stationers' Company on 18 February 1568, Harte was apprenticed to John Windet, citizen and stationer in London in 1587. John Moungwell had a relative of the same name, apprenticed to Michael Harte, and may have learned his trade from him. These two, or possibly three, direct infusions of knowledge and expertise from outside Exeter sufficed for 26 out of the 36 Exeter booktrade freemen recorded between 1573 and 1700. Of the remaining ten some, such as Henry Humphry, bookbinder, free in 1662, may have been self-taught. There is no trace of his having been apprenticed in London, and he was a freeman by succession, his father probably having been a baker. He does not seem to have been very successful at his craft as his admission fees were remitted because of poverty. The three dynasties also account for twelve out of the twenty names that appear in Exeter imprints between 1594 and 1700. The most prominent of those not included is probably Christopher Hunt, apprenticed to Thomas Man, citizen and stationer of London in 1584 and free of the Stationers' Company in 1592 and of Exeter in 1593. He was responsible for Exeter imprints in 1594 and 1596 before returning to London. Some of Michael Harte's successors in Exeter must have run considerable businesses in the 17th century. One, Abisha Brocas, two generations down from Michael Harte, being apprenticed to John Moungwell, Harte's own apprentice, even issued tokens to supplement the chronic shortage of small change. Two farthing tokens are recorded bearing his name, one with the symbol of a coffee pot and a Turk's head dated 1669 and another with the symbol of a book and the inscription "Steward of the Corporation 1672". Between 1662 and 1674 his name appears on the imprints of eleven items, several in conjunction with the London bookseller Richard Royston. Brocas, Royston and Christopher Hunt of Barnstaple cooperated in the printing of a leaflet entitled Books lately printed for R.Royston in London, and sold by Abisha Brocas in Exeter; and Christopher Hunt in Barnstaple. My desire is that you w[orshi]p would be pleased to moove his Grace that I may be furnished with letters missive that the 5 delinquents as abovesayd may answer to theyr severall contempts according to justice. The five boksellers mentioned represent two of the three main dynasties joining forces to round on a threatening group of outsiders (Plomer 1919, 35-36). But of necessity provincial booksellers had be part of an external network to be able to obtain their stock in trade and various links between London and Exeter can be traced throughout the 17th century. Thomas Hunt of Exeter has his name in the imprint of at least five books between 1631 and 1648. Of these the first, a work by John Mico, rector of St Petrock, Exeter, was published by James Boler in London. Two other works, including the first edition of Robert Herrick's Hesperides, published in 1648, were printed for Francis Eglesfield. Eglesfield had been apprenticed to Boler in 1628, and was three years into his term when his master was in contact with Thomas Hunt in Exeter (McKenzie 1974, 19). Perhaps he even had a hand in the negotiations. Hunt, as we have seen, is a member of a long-lived Exeter artisan dynasty. Eglesfield too maintained his links with the Westcountry over a number of years, for example publishing Christopher Jelinger's The excellency of Christ in 1641 in assocation with William Russell, bookseller in Plymouth. Another link which has already been mentioned is traceable through Freeman Collins, who printed at least four items for Exeter booksellers between 1682 and 1697. He was the son of Thomas Collins of Exeter, and did not sever all ties with his native city after he went to London in 1669 to be apprenticed to Thomas Newcomb. In such ways a complex web of contacts was built up during the century and by 1700 the Exeter book trade could call on no less than five members of the famous grouping of London booksellers known as the Conger with whom they could participate in publications, at least to the extent of having their names included on the imprint. These five are Richard Chiswell with a 1682 imprint, Jonathan Robinson with imprints in 1694 and 1707, J.Taylor with a 1700 imprint, Awnsham Churchill with imprints in 1694 and 1701 and Thomas Bennet himself, the keeper of the famous notebook of Conger dealings, with imprints in 1699, 1701, 1702 and 1704 (Maxted 1989). Unfortunately none of the Exeter imprints in this period feature in his notebooks as works handled by the Conger (Hodgson). Booksellers, because of their network of trade links, were well placed to market other branded goods and Abisha Brocas was also involved in such ventures. His name appears among the lists of vendors in the 1667 and 1676 editions of An advertisement concerning those most excellent pills called Pillulae radiis solis extractae, an antimonial pill. This had been developed by the chemist physician Lionel Lockyer (1600-72) who marketed them in latten boxes containing about 100 pills. This is an early example of book trade involvement in the marketing of patent medicines, something which would become much more highly developed in the 18th century (Hargreaves 1997). Some who fell outside the structure of the three dynasties are specially significant. Not only do they fall outside the main lines of succession, but they are not even free of the city. They are all printers: Barker and Bill, the King's printers who passed through Exeter in 1645, J.B. (probably John Bringhurst), associated with a group of imprints in 1688 connected with the invasion by William of Orange, Samuel Darker, Exeter's first permanent printer, who arrived in Exeter by 1698, and Samuel Farley, who became his partner in 1699. The printers played a role in breaking up the close-knit structure of the Exeter book trades, although they were probably applying pressure to a system of guilds and freemen that was already in decline. It is not clear to which of the guilds, if any, book trade personnel may have belonged, guild records for Exeter have for the most part disappeared. Even within the traditional civic framework fathers were beginning to send their children outside Exeter to gain experience. Charles Yeo, apprenticed to Robert Eveleigh in the Moungwell dynasty, sent his son Philip Yeo to be apprenticed to Awnsham Churchill, citizen and Stationer of London in 1701. McKenzie does not list his freedom in the Stationers' Company, but he became a freeman of Exeter in 1701. 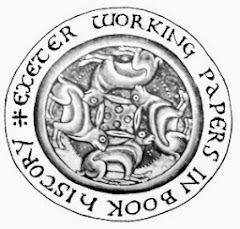 Certainly printing was not a traditional occupation for Exeter and this may have helped to relax the structure of the trade in the following century.